Keiichi Maebra, a teenage boy who recently moved to the sleepy village of Hinamizawa in the mountains of Japan, fears he might be murdered. The village has a dark reputation. Beneath it’s picturesque exterior, rumors of a man-eating demon lurk. A demon the villagers aid in its mission of protecting their villagers. Outsiders have to be sacrificed to it, and Keiichi’s new friends, the girls Mion and Rena, might not be humans like he thought. They might be demons wanting to murder him. He’ll have to find the evidence to prove what is going on and defend his life before he’s the next person demoned away. The paranoia and fear escalate. Rena especially seems to transition from her normal, cute girl persona to a demonic, cat-eyed demon. She goes from taunting Keiichi to wanting him dead, demanding to know his secrets. The art gets crazy, capturing Keiichi’s terror along with transforming the young Rena into something monstrous and terrifying. And when you know the secret of the series, these scenes only become more tragic. The clues are there, little speckles at the true story, but that first time you read it, you’re left stunned. How did this happen? It all started so fun, so light-hearted. Keiichi, Mion, and Rena were such good friends. They were playful and innocent. And then syringe and the baseball bat. At the end, you’re wondering how this series can continue? Where could it possibly go after this ending. Where it goes only makes this series more intriguing. The story may seem over, but it is far, far from complete. 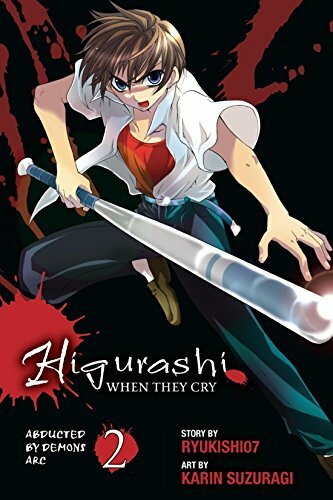 You can buy Higurashi Abducted by the Demon Arc 2 from Amazon.